How to Come Up With a Blog Name in 5 Pain-Free Steps! I see you, future blogger. You’re sitting there with pages and pages of crossed-out blog name ideas, pulling your hair out over how to come up with a blog name. I FEEL you. When I launched this blog in 2012, coming up with a blog name was the HARDEST part for me. In fact, it took me more than a month to finally launch because I couldn’t pick a name, and then when I finally did, I changed it. To make things easy for you, I’m going to walk you through a 5-step pain-free process that will help you come up with a blog name fast! 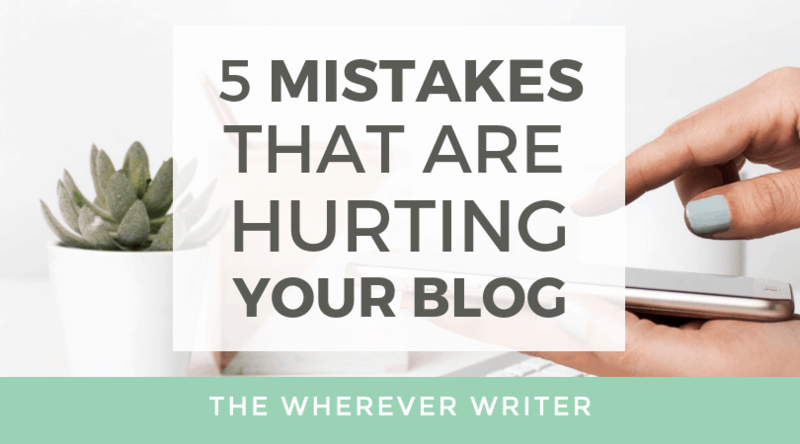 Seriously, by the end of this post, you’ll have picked the perfect blog name so you can launch that blog. How Important Is a Blog Name? Serve as a quick-and-easy way for people to remember how to find your blog. Help first-time visitors instantly understand what your blog might be about. A blog name, just like any business name, is important—but you can ALWAYS change it later, so don’t stress out so much about it that you never launch your darn blog! What’s the difference between a blog name and a domain name? A blog name and its domain name are usually the same, but not always. For example, my blog name is The Wherever Writer, but my domain name is WhereverWriter.com. I did, however, buy TheWhereverWriter.com and have it redirected here just in case someone makes the mistake of adding “the” to the URL (it happens). So grab a pen and paper, and let’s walk through how to come up with a blog name. and write down ALL the words you can think of that are associated with the topic you want to blog about. At this point, don’t judge what you’re writing. You are free writing, so just jot down the first words that come to mind until you’ve exhausted all your options. Once you’ve thought of every word possible, use a thesaurus to find even more synonyms. Step 2: Mix and match the words. Step 3: BEFORE YOU FALL IN LOVE WITH ANY OF THEM, check to see if that domain is available in a domain checker. 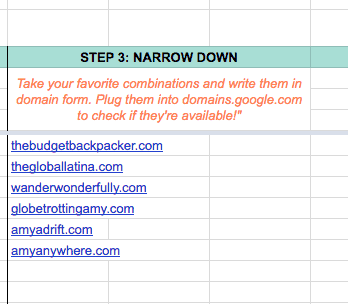 While you’re brainstorming, I recommend you have domains.google open in another tab and you check every blog domain you come up with to see if it’s available. 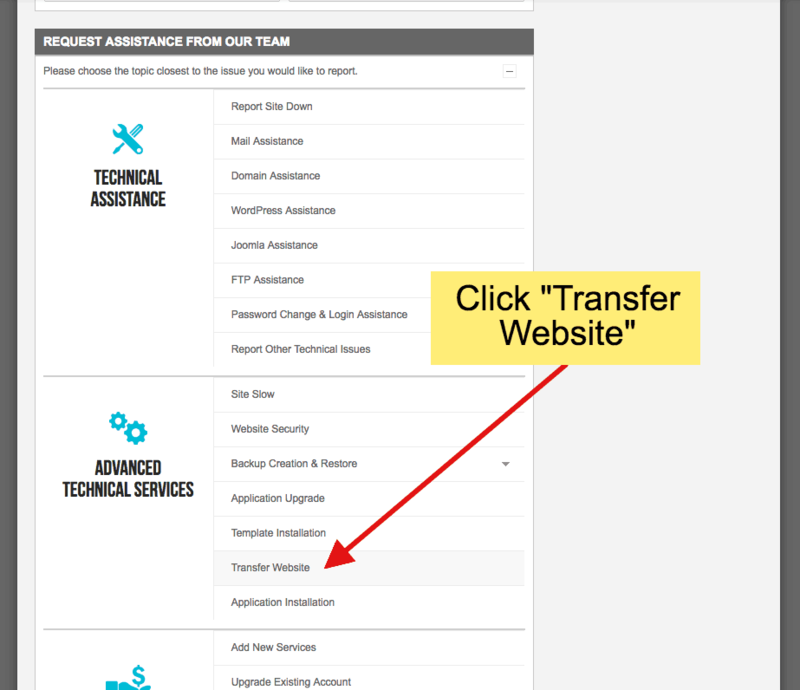 Use SiteGround Domains for checking the domain availability but DO NOT PURCHASE your domain yet—you can purchase the domain when you sign up for your web hosting with SiteGround, making it simpler because you eliminate the extra step of having to connect your domain from outside with your SiteGround hosting account. Just trust me on this one. Step 4: Narrow it down to your top 5 picks. I know this is hard, but you don’t want to have TOO many to choose from. Say the name out loud. Say the name out loud with “.com” at the end. Does it roll off the tongue? Or is it a mouthful? Narrow down to your top 5; ideally, your top 3. Step 5: Ask your friends or colleagues. Now bounce those ideas off your friends or colleagues. Ask them what comes to mind when they hear each name. First impressions are big, so you want to make sure that the image you’re trying to convey is coming across in your blog name. Profanity – This will hurt your professionalism and block you from getting to participate in future collaborations. Negative terms – Even if your blog name isn’t outright profane, even one that includes a term with a negative connotation, this can hurt your brand later on down the line. Examples of such negative terms might be “cheap,” “broke,” or . Having said that, The Broke Millennial is a very popular blog, so she’s done well for herself even with a term that can have a negative connotation! Don’t pigeonhole yourself! I see this happen all the time with bloggers. For example, let’s say you’re going on a trip to France so you want to start a travel blog. DO NOT name the travel blog based on this specific location, France, unless you plan to ALWAYS write about France. Likely, you won’t, so broaden it out to travel rather than a specific location. Brand names – Don’t use trademarked names! One example of this might be “Disney.” Don’t do it. REALLY long names – They’re way too hard to remember! STILL Can’t Choose Between Your Top Blog Name Picks? Go with the shorter one. The shorter the better. Go with the more broad one if you’re afraid the others will box you in. Finally, if you just can’t choose, tear up separate pieces of paper with each blog name on it, and pick one randomly out of a hat. Or play heads or tails if it’s stuck between two options. If you’re THAT stuck, it really won’t matter which one you end up using. Seriously. Just pick one and move on! When you’re thinking of how to come up with a blog name, you might consider this: If you’re aiming to start a profitable blog, YES, your domain name DOES matter. I see it all the time in Facebook groups: Some bloggers are unable to secure collaborations with big companies because the blogger’s domain name is unprofessional or negative. Most of the time, this occurs when a domain name includes the word “cheap” or anything that connotes that, words like “frugality” or “couponing.” This is unfortunate, but true. So I would avoid using a word that might affect brand collaborations in the future. Hippie In Heels (hippie-inheels.com) Uh-oh, but the domain has a hyphen, which led to me going to the wrong URL at first! Nevertheless, the name has a nice ring to it. 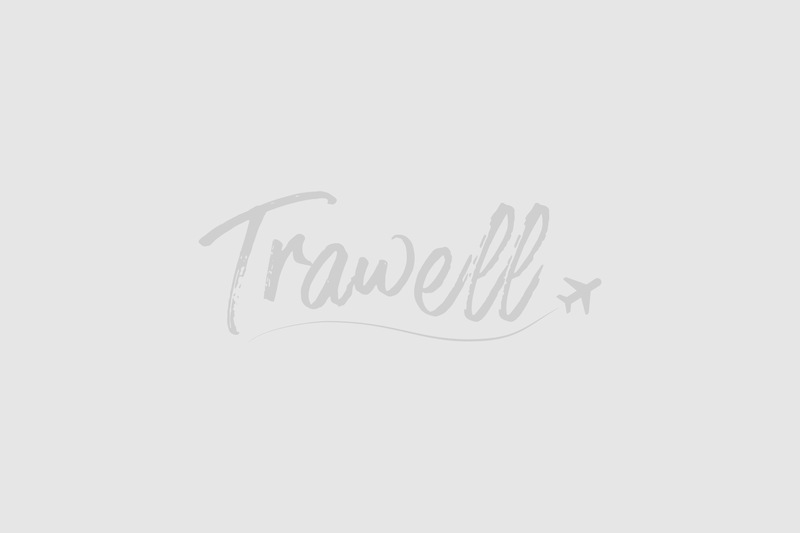 The blog focuses on budget travel with a dash of luxury. What makes these good names? You get an idea of what the blog is about just from the name itself, plus, the names are fun, short, and easy to remember. Buy your first and last name (or first, middle, and last name). This is just a good idea to do anyway. Just PICK ONE. Relax. You can always change the name later. Example: The famous MelyssaGriffin.com used to be TheNectarCollective.com for a long time. My blog (WhereverWriter.com)? Its first domain name was … wait for it … Wanderlustrious.com! ? Thankfully, I changed my domain name a week or so after launch, so no one really go to know the first name. 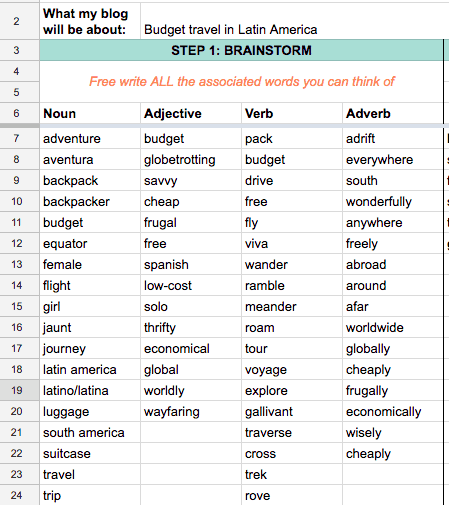 Step 1: Brainstorm ALL the words associated with what you want to blog about. Step 2: Mix and match the words to come up with cool combinations. Step 3: Use a domain checker to make sure that domain name is available. Also, do a quick Google search to make sure there aren’t similar names out there. Step 4: Narrow it down to your top 5 choices. Step 5: Ask friends and colleagues for feedback. Woohoo! You’ve Come Up With a Blog Name ?? I hope this 5-step process of how to come up with a blog name was helpful. Now that you’ve got the perfect blog name, make sure to claim it! Head on over to my post on how to launch your blog When you set up your web hosting you’ll be able to secure that domain name you just picked! Now, tell us in the comments, what blog name did you choose? ?